Once I started talking to experts, I quickly discovered it’s not just parents who are confused. The world of research on kids and media, especially on increasingly ubiquitous mobile and touchscreens, is relatively young, hotly contested, and full of gaps. Enduring a tantrum-prone toddlerhood, if you will. I often have my phone in my hand while breastfeeding my one-year-old daughter. This isn’t a confession, because I don’t feel guilty about it. Even though there are lots of people implying that I should. I’m delivering a six-foot-tall Elmo a roundhouse kick in the guts. His stomach slices into angular shards as my foot intersects with it. Next, I step over to his friend Grover . . . closer . . . closer . . . and finally place my head directly inside his looming, black, black, black void of a mouth. Best thing I've done w/ my 12yo is getting a 2nd controller for our PS4 so we can play video games together in living room. Lego games in particular have co-op mode so we both have characters on screen at same time. We work together to solve puzzles. As technology increasingly dominates the lives of children, there remains a dearth of conclusive evidence about best practices for parents. Last month, Facebook released Messenger Kids, sparking outrage among child health advocates. Currently, two Apple shareholders are pushing for the company to reprogram the iPhone and iPad to allow for greater parental controls. In “The Art of Screen Time” Anya Kamenetz pieces together scientific research and personal experience to help families navigate their relationships to screens in a digital world. She joins us to discuss the book’s major takeaways. Seattle’s recently-passed universal pre-k measure included a stipulation of standardized testing, but according to Kamenetz, today’s schools are sacrificing learning by enacting such regulations. Her insightful look at the world of standardized testing is a wake up call for teachers–and parents–to move beyond numbers, and refocus on the child. Anya Kamenetz, author of The Art of Screen Time: How Your Family Can Balance Digital Media and Real Life, a mother of a six-year old and a toddler, monitors her own kids’ screen time quite closely. “In our house video watching is a Saturdays-only activity for the big girl,” she said. “Having clear rules works well for us at this age. During the week she gets three iPad sessions of 20 minutes to half an hour. We also have exceptions like travel, vacation and sick days, but even on screen days we make sure to balance with other activities,” she says. Anya: I don’t regularly meditate, but I stop and take deep belly breaths throughout the day, especially before I pick up the phone, go into a situation that makes me anxious, or go to bed at night. This entry was posted in Uncategorized on March 2, 2018 by Anya Kamenetz. New Tour Dates: Chicago, Texas, Bay Area, More! This entry was posted in Uncategorized on March 1, 2015 by Anya Kamenetz. Publication Day; Excerpt in Salon.com! An excerpt from The Test ran in Salon.com over the weekend. I’m really happy with the responses so far! If you can’t manage what you don’t measure, as the business maxim goes, how do we measure the right things so we can manage the right things? How do we preserve space for individual exploration while also asking our children to hit a high score? Is there any way to channel the collective thirst for metrics and data into efforts that actually make our schools and our communities healthier and our children more successful? The modern era of high-stakes standardized testing kicked into gear at the turn of the twenty-first century, with federal No Child Left Behind legislation mandating annual math and reading tests for public school children beginning in third grade. It has not been a golden age. Standardized testing has risen from troubling beginnings to become a $2 billion industry controlled by a handful of companies and backed by some of the world’s wealthiest men and women. This entry was posted in Uncategorized on January 6, 2015 by Anya Kamenetz. I appeared on All Things Considered last week talking about the Atlanta cheating trial, in an interview that drew on my research for The Test. Listen and read here. The defendants are 12 former employees of Atlanta Public Schools. They are accused under the state’s racketeering laws of conspiring to falsify their students’ results on state standardized tests. Dozens more school employees have faced ethics sanctions in a case that has rocked the city of Atlanta for the past few years. The trial is unusual. It’s likely that millions of dedicated teachers around the country spend their entire careers without engaging in the kind of behavior that happened in Atlanta, or that I heard about in that spa. But high-stakes state standardized tests of this kind are not unusual. They are mandated in nearly every public school by No Child Left Behind, the 2001 federal education law. These tests are high-stakes because they trigger serious consequences for students (like grade promotion and graduation); for schools (like extra resources, reorganization, or closure); for districts (the loss of federal funds); and for school employees (bonuses, demotion, poor evaluations, or firing). And so the Atlanta trial should bring two questions: How common is cheating on these tests? And short of cheating, what else might be happening in schools as a result of these tests? This entry was posted in Uncategorized on October 6, 2014 by Anya Kamenetz. 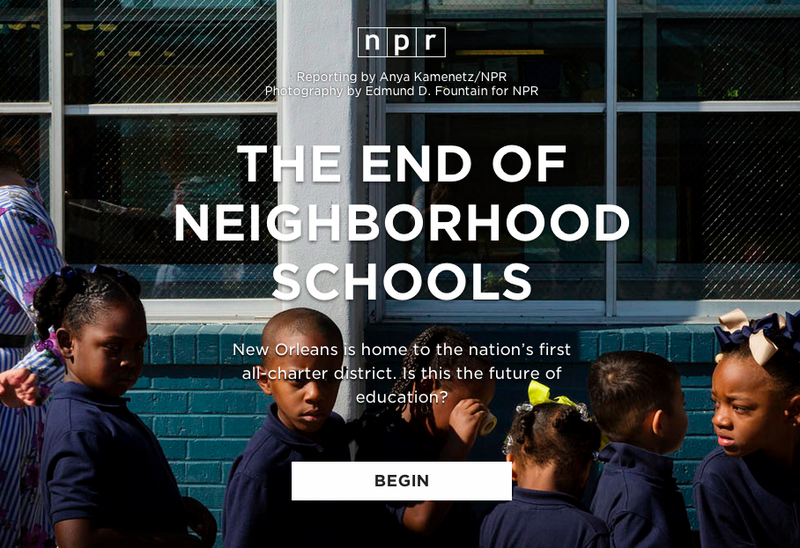 Here’s one of my recent pieces for NPR.org: a report from New Orleans, where over nine out of ten children attend charter schools. This entry was posted in Uncategorized on September 16, 2014 by Anya Kamenetz. The Test is Out January 6–But You Can Order It Now! Pre-order The Test from IndieBound or many other fine booksellers.